Set a hasher to use when writing. Set a hasher to use when reading. Set an encryption Initialization Vector. Set a decryption Initialization Vector. Get the Initialization Vector that will be used for the next encryption. Get the Initialization Vector that will be used for the next decryption. Set the plaintext offset to use when encrypting. Get the plaintext offset of the encrypted data. Construct a KLVEObject linked to an encrypted KLVObject. 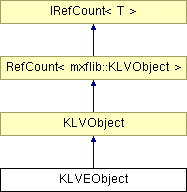 Initialise the KLVEObject specifics after basic construction (and KLVObject::Init()). Get the size of the key and length (not of the value). Get the track number of this KLVObject (if it is a GC KLV, else 0). Get text that describes where this item came from. Read the key and length for this KLVObject from the current source. Read data from the start of the KLV value into the current DataChunk. Read data from a specified position in the KLV value field into the DataChunk. Write the key and length of the current DataChunk to the destination file. Write (some of) the current data to the same location in the destination file. Write (some of) the current data to a different location in the destination file. Write data from a given buffer to a given location in the destination file. Get the length of the value field. Set the length of the value field. Load the AS-DCP set data. Read the AS-DCP footer (if any). Calculate the size of the AS-DCP footer for this KLVEObject. Write the AS-DCP footer (if fequired). Read data from a specified position in the encrypted portion of the KLV value field into the DataChunk. Read an integer set of chunks from a specified position in the encrypted portion of the KLV value field into the DataChunk. Write encrypted data from a given buffer to a given location in the destination file. Pointer to the encryption wrapper. Pointer to the decryption wrapper. Pointer to a hasher being used for hashing data being written. Pointer to a hasher being used for hashing data being read. True once the AS-DCP header data has been read. The context ID used to link to encryption metadata. Number of unencrypted bytes at start of source data. Key for the plaintext KLV. Length of the encrypted KLV Value. Number of bytes used to encode SourceLength in the KLVE (allows us to faithfully recreate if required). The Initialization Vector for this KLVE. The check value for this KLVE. The optional TrackFile ID or NULL. The optional Sequence Number of this KLVE within the TrackFile. True if SequenceNumber has been set or read. The optional MIC (if loaded or computed when reading or computed when writing) else NULL. Offset of the start of the encrypted value from the start of the KLV value. Encryption IV if one has been specified. The location of the next read (if reading in sequence) - used to detect random access attempts. The location of the next write (if writing in sequence) - used to detect random access attempts. Number of extra bytes decrypted last time that are buffer for the next read. Left over bytes from decrypting the last chunk - these will be returned first with the next read call. Number of left over bytes not encrypted last time that are buffer for the next write. Left over bytes from encrypting the last chunk - these will be written first at the next write call. The size of the AS-DCP footer to be written for this KLVEObject. The AS-DCP encryption system adds 32 bytes to the start of the encrypted data. The AS-DCP encryption system forces all encrypted data to be in multiples of 16 bytes. As there may be a need for the implementation to know where within the value field this data lives, there is no WriteData(Buffer, Size) function.